If you want to experience traditional rural Japan and you’re willing to drive a rental car, the Kitayama Mountains north of Kyoto make the perfect day trip. While Kyoto is surrounded by mountains on three sides, the Kitayama Mountains, which lie to the north of the city, make the best destination for daytrips out of the city. There are easy drive and they’re filled with temples, traditional thatched-roof houses and scenic vistas. The most popular destination in the Kitayama area is the village of Kurama, which is famous for its mountain temple, Kurama-dera Temple. This is the classic daytrip out of Kyoto and it is easily reached by the Eiden Eizan Line, which leaves Kyoto’s Demachiyanagi Station (at the northern terminus of the Keihan Main Line) and arrives in Kurama 30 minutes later. Some cars on this line have special sightseeing cars that allow you to enjoy the views of Mt Hiei and the southern Hira-san Range. Once the train passes Ichihara, you enter forest, including some nice stretches of bamboo and maple. The classic hike here involves climbing to the main hall of the temple, then over the peak of Mt. 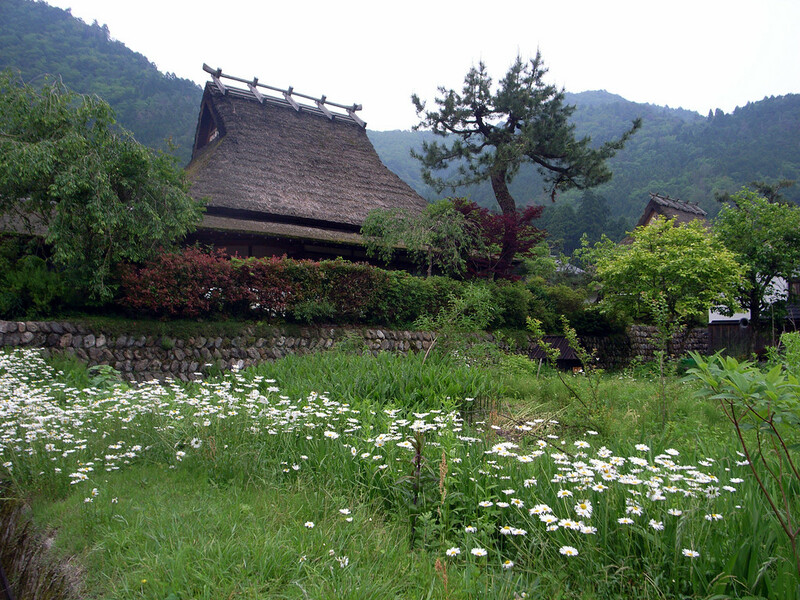 Kurama and down to the picturesque village of Kibune, from which you can hike down to Kibune-guchi Station on the Eizan Line (total hiking time about three hours at a relaxed pace). For full details, visit our Kurama to Kibune Hike page. For most visitors to Kyoto, their exploration of the Kitayama area ends here. This is a shame, because some of the real wonders of the Kitayama area lie over the next mountain passes to the north. If you’re going to explore the mountains north of Kurama, you pretty much have to go by car (or bicycle, if you’re really fit). True, Kyoto Bus runs two buses a day in either direction between Demachiyanagi and Hirogawara (in the heart of the mountains), but it’s hard to do much exploring if you’re tied to these buses. If you’ve got an international license, your best bet is to rent a car in Kyoto and drive. The Toyota Rentacar branch at Kyoto’s Hyakumamben (tel 075-702-8100) is conveniently located for trips into the Kitayama. It’s about 15 minutes’ walk east of Demachiyanagi Station, just north of the Hyakumamben intersection, on the east side of Higashioji-dori. They’ll rent you a compact car, with insurance, for about Y8000 per day. From Hyakumamben, drive north to Kurama via Iwakura or Ohara (the latter route involves crossing Bunmata-toge Pass). Heading north out of Kurama, Rt 38 climbs steeply to cross Hanase-toge Pass (becoming Rt 477 on the way). The forests here are mostly monotonous stands of sugi (cedar), which will whet your appetite for the more beautiful mixed forests found to the north. Note that this pass (and the others north of here) are very treacherous if there is snow on the ground, so we don’t suggest attempting this after a snowfall. After you descend from the pass, you’ll enter the town of Hanase, located in a lovely valley that feels worlds away from the cities to the south. There are several well-preserved kayabukiya (thatched-roof houses) here, some of which have been turned into restaurants or coffee shops. Near the northern end of the valley, after you leave Rt 477 and turn right onto Rt 38, keep an eye out for the turnoff to Bujo-ji Temple (峰定寺) or Miyama-so (美山荘), a ryokan near the temple. This is one of the most interesting and least visited temples in the Kitayama Area. It’s in the hamlet of Hanase-Harachi-cho, a short distance before Hirogawara, about two kilometers east of Rt 477 (if coming by Kyoto Bus, get off at the Daihizan-guchi stop and walk east for 30 minutes). 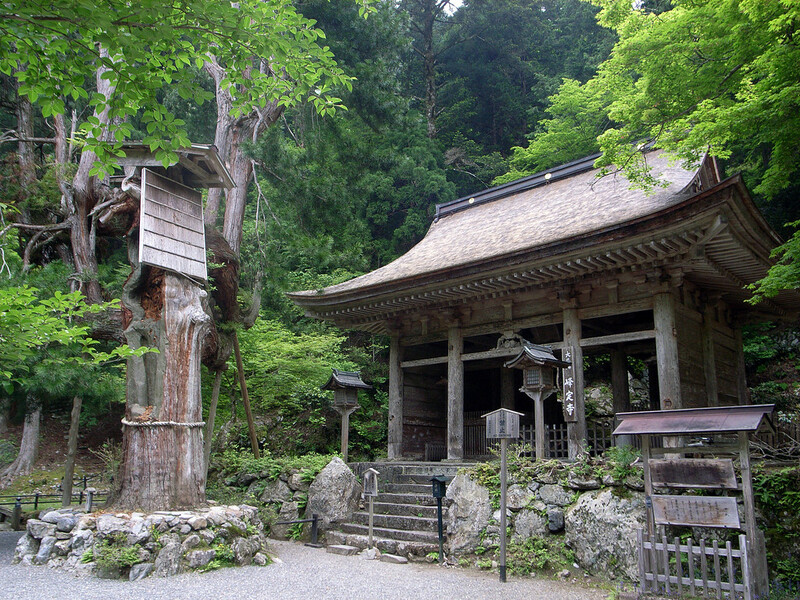 Bujo-ji is a shugendo (mountain asceticism) temple that is sometimes called “the Northern Omine,” a reference to Mt. Omine-san in Nara Prefecture, which is a center for Japan’s yamabushi (mountain mystics). It’s also called a “mini Kiyomizu” because it features a verandah built over a mountainside on stilts, like the famed Kiyomizu-dera Temple in Kyoto. The people who run the temple take the whole mountain mysticism thing pretty seriously and you can’t just pay your admission and waltz up the 430 steps to the main hall. First, you have to surrender your bags and cameras, then they’ll give you a special pilgrim’s bag and staff, along with a printout of a mantra that you are supposed to chant as you climb. Only then are you allowed to pass through the gate and climb to the main hall. Just before the hall, ring the bell and focus your thoughts and then climb to the verandah and soak up the view. The temple is open from 9am to 3.30pm (until 3pm in winter), costs Y500 and cannot be entered by children younger than 12. It’s closed on rainy days. After visiting the temple, head back to Rt 38, drive north to the hamlet of Hirogawara, and continue north over Sasari-toge Pass (keep in mind that the road is closed in winter). As you cross the pass, you’ll notice a change in scenery as you enter the hamlet of Ashiu. The forest north and east of the pass belongs to Kyoto University and is maintained as a forestry research center. This is some of the last truly virgin forest in Japan. One sight of this pristine, largely broadleaf forest is enough to make any nature lover weep: forests like these, which once blanketed much of the Japanese archipelago, have been almost totally replaced by industrial sugi forests that support minimal bird, insect and mammal life. Hiking trails enter the forest from above the stone hut at Sarari-toge and from the village of Ashiu, at the bottom of the pass (note that you are supposed to register at the office in Ashiu before entering the forest). The most basic walk here involves walking up the old train tracks along the undammed Yura-gawa River. More serious hikes continue beyond the tracks up the river or up side valleys. If you intend to do proper hiking here, grab a copy of Shobunsha’s Yama-to-Kogen Kitayama map. If you’ve still got time and energy after checking out Ashiu, drive west along Rt 38 for about 20 minutes to reach the hamlet of Kita, in Miyama-cho. Sometimes known as “Kayabuki-no-Sato” (the Village of Thatched-Roof Houses), this quaint hamlet is said to contain the thickest concentration of thatched-roof houses in all Japan. There are about 250 such dwellings tucked against the mountainside here. 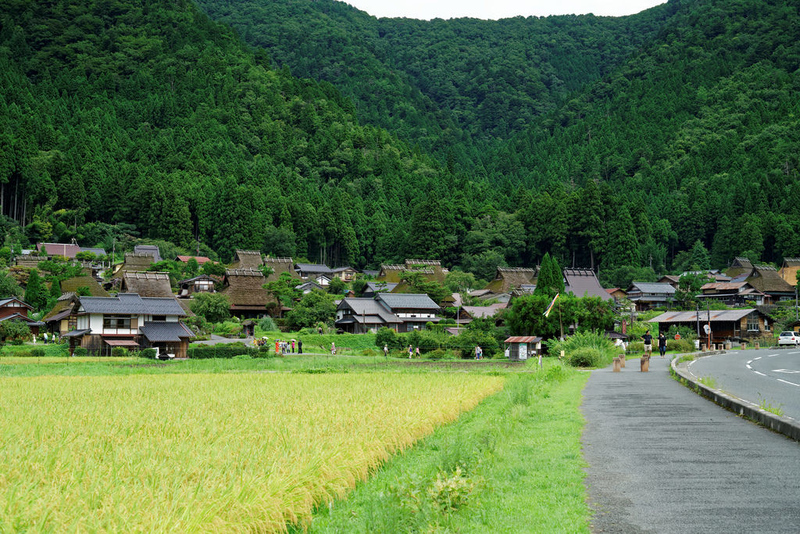 This village is far more appealing than the thatched-roof village of Shirakawa-go in Gifu-ken, which has become something of a tourist trap since being listed as a UNESCO World Heritage Site. Sights to see here include the Minzoku Shiryokan (translated on one local map as “Fork Museum,” but we think they meant “Folk Museum”) and the Chisana Aibijutsukan (“the Little Indigo Museum”). From the village of Kita, it’s a pleasant two-hour drive back to Kyoto.